Daecheong Lake, a place for lovers. Woe be unto lovers. Who has not, upon visitng the same theater for the eighteenth time, grown weary of their love? Who, groaning and gnashing teeth, has not spent sleepless nights asking “how might I spice up date night?” Surely there are few who, casting their eyes upon Pizza Hut’s “Deluxe” buffet for the sixth time in a month, have not wished to end the life of their beloved. The pitfalls and trials of love are, indeed, both numerous and enduring. In the interest of lessening the suffering of Daejeon’s lovers, I offer three strategies and one location. So please, before attempting to choke your lover to death on pepperoni topping, I ask that you take heed of these, my humble suggestions. Those wishing to over-awe their loves with scenes of beauty and nature should visit the Daecheong Lake area, a charming getaway located just outside Daejeon, South Korea. Daecheong Dam offers carefully manicured parks, winding boardwalks and a glorious view of both Daecheong Lake and the Geum River valley. Picturesque families with 2.2 children, benevolently grinning wives and sleek husbands play catch among the white and pink cherry blossoms. Children of less attentive parents slip upon the polished stones of the “Water Culture” building’s pavilion, screaming in joy and hiding behind the dozens of stone sculptures. Slabs of smoked freshwater eel drips juice and sends savory aromas up from picnic barbecues. Squeeze your beloved’s hand as you watch ducks frolic before you, steam rise from the cold river waters below and ajummas (middle aged Korean women experiencing a second adolescence) enact some of the more violent scenes from Mortal Kombat behind you. Do you seek a tactful way to say “my beloved, I no longer rejoice upon seeking your love handles jostle violently with each step, let us exercise before your blubber becomes self-aware and smothers me in the night”? If so, you should also go to Daecheong Lake.There, you might guide your love onto the tree-lined hiking trails snaking through and around Hyeonamsa Temple. Hawks nest in the area, along with dozens of smaller birds to fill the evening with song. The climb to Hyeonamsa Temple is vigorous, but upon reaching the top you might enjoy the view of Daecheong Dam while your beloved sweats profusely and gorges on sticks of butter. Korean Buddhist architecture is quite pretty as well, so the health conscious and aesthetically sophisticated lover will find much of interest. 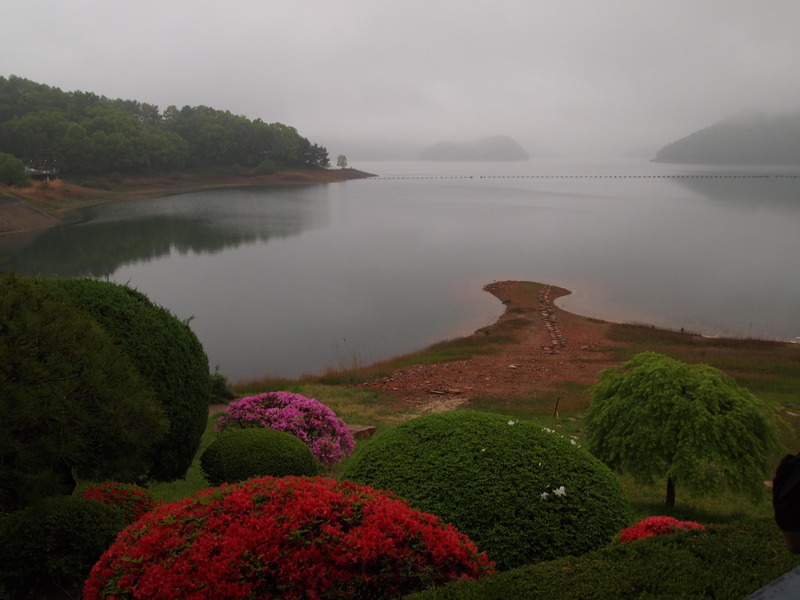 Lovers moved by the spirit of revenge should also visit Daecheong Lake. The roads to and from Hyeonamsa wind and twist like infernal snakes. Blind corners, tight switchbacks and a great many cliffs combine to form a perfect environment for performance driving or riding. Enjoy the sweet sounds of your beloved’s terrified screams as you drift around the hairpins. Glory as your beloved’s fingers dig into your sides over each blind crest and sudden drop. Go at night and join dozens of performance enthusiasts, both in sports cars and aboard superbikes, for an evening of low level terrorism.